Outfits with Hiking Boots – The best way to experience the diverse landscapes of the world is by hiking through them. So that comes off with, Are you planning to go for Hiking with friends and family during vacations?. If Yes, then you must be thinking about what outfit to wear with your Hiking Boots as one might be short of ideas in this matter. 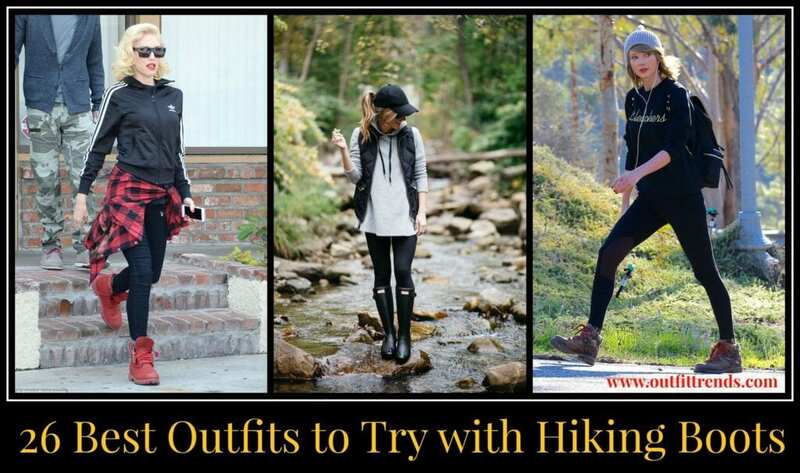 Make sure that Hiking Boots are making a comeback in today’s fashions.Therefore this blog will bring forward 26 best outfits with Hiking Boots that you can adopt as your own style statement. From summer to winter or for some buddies gatherings, you can style these boots in numerous ways. Discover the tips and tricks of putting on these Hiking Boots in a gorgeous and chic way. Girls always desire to look stylish yet want to wear something comfortable therefore always go for the classic color palette. 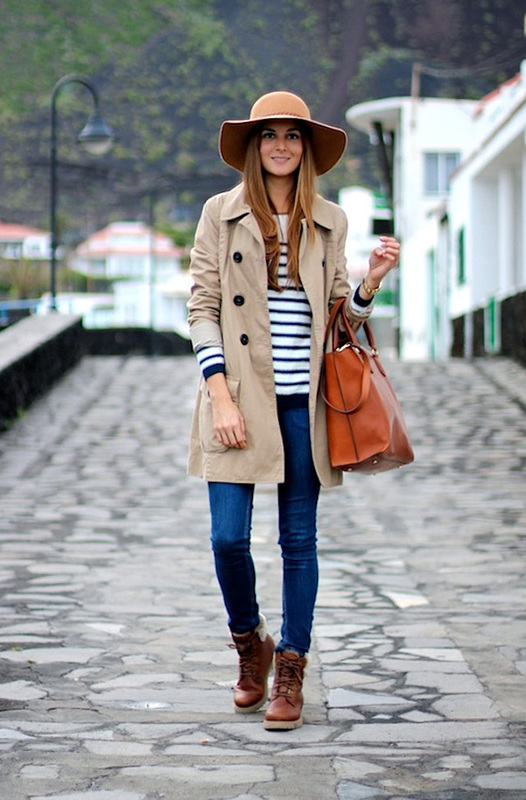 As in the picture below, that model is wearing a blue striped shirt, blue jeans, beige half coat team it up with brown Floppy Hat and Brown Hiking Boots. One should always keep in mind that in order to look stylish one should accessorize themselves smartly as the model is holding a rust colored handbag with the golden bracelet. With all this, her personality is turned into as decent, graceful and an elegant person. This whole attire can be adopted by all age group of girls, who are planning to go out for lunch with friends or family. Here are some more cool Outfits with Striped Shirts. College girls are always in a hurry as getting up late from bed puts them in this situation. As these girls always desire to look more stylish with less effort, therefore, a model in the picture perfectly portraits how to dress fashionably in short of time. A gray sweatshirt, blue skinny jeans pinned up with a long baggy beige coat and some prominent style of black hiking ankle boots can give them that head turner look. Also have a look at these amazing Outfits with Combat Boots. Styling with the Hunter Boots is not as easy as one thinks as one can’t put them on with baggy jeans or loose straight pant as by doing this it will ruin the entire look. Individuals who are planning to go hiking these hunter boots will be perfect for them as these a long therefore no insect or bug will bite. The model exhibits how to style with these hunter boots, black J. Crew Puffer vest, gray hood, black yoga pants and lastly the black hunter boots. This all is team up very well and portraits that the individual is very athletic and fashionable. The Celebrity Taylor Swift presumably sticks to her hiking schedule in a black Bleacher’s sweatshirt, leggings, Marie Claire hiking boots, and a knit beanie. Here are some more Chic Outfits to Wear with Beanies. Casual dressing can be a bit tricky. Wear a light colored shirt with gray ripped jeans and boots with socks which will give a vibe of casual dressy. Here’s an awesome guide on How to Wear Shearling Boots. Usually, the celebs give us the right way to wear our accessories. Red hiking boots not only look cute but they work best in daily routine as well. That’s why celebs love to wear them on their casual routine days. The 45-year-old Gwen Stefani looks stylish in her sportswear. She is wearing a 90’s style Adidas zip-up top with dark blue skinny jeans, and a fennel t-shirt tied around the waist. Anyone who wants to spend the quality time with family with the 1990’s themed then they can adopt her styling sense as this is entire outfit is very casual, comfortable and easy to move around. Here are the best Women’s Outfits with Red Shoes. 69 years old the American celebrity Goldie Jeanne Hawn who is an actress, director, producer, and occasional singer, is in a dark black perfectly sized up top and skin-tight leggings went for hiking with her buddy in the mountains around Los Angeles in the picture below. She teamed her exercise outfit with gray trainers and a gray zippered jacket, tied around her waist. AndG accessorized with a large pair of trendy cat-eye shades, hoop earrings and a gold pendant on a short chain.Her Buddy was more brilliantly dressed up, wearing a turquoise zippered jacket, a blue and white T-shirt and blue leggings and trainers. Women belong to this age group can adopt her dress style that is easy to move around with and comfortable. Check out these Casual Outfit Ideas for Women Over 60. Girls who want to go out with friends in a casual dress then they can adopt the dress style of the 31-year-old celebrity Nicole and her friend Cara. Both of them are in the picture below who are spending some quality time together.The star, Nicole, looked as tanned and trim as ever in a white vest top, scrunched on one side and embellished with a black broach, three-quarter length black Nike Lycra pants and hiking boots. Cara looked similarly chic in her ensemble, a white T-shirt, a pair of black Nike Lycra leggings, and Nike Hiking boots.